Symposium 2A - Competencies and Milestones: Will those who ignore the past be condemned to repeat it? Symposium 4B - New Perspectives on Curriculum and Course Design: The End of PBL? Please note it may take 12-24hrs for video on demand content to appear. Follow @AMEE_Online for twitter updates, or contact support@switchnewmedia.com for further information. The plenary sessions and the symposia are being live streamed for participants unable to attend in person. As conference participants you will have access to these streams live on the day, and after the event, so if you miss one of these sessions you will be able to view it here on our online video archive. * View the Agenda tab for timings. All AMEE 2014 conference sessions will be held at the MiCo Conference Centre, Milan, Italy. The Current Local Time is * Please note: The times given below are local Milan time which is Central European Time Zone (UTC+01:00). Recordings of live sessions will be available the same day should you be unable to watch the live stream. Richard Horton is Editor-in-Chief of The Lancet. He joined The Lancet in 1990. Richard was the first President of the World Association of Medical Editors and he is a Past-President of the US Council of Science Editors. He is an honorary professor at the London School of Hygiene and Tropical Medicine, University College London, and the University of Oslo. He has received honorary doctorates in medicine from the University of Birmingham, UK, and the Universities of Umea and Gothenburg, Sweden. In 2011, he was appointed co-chair of the independent Expert Review Group overseeing delivery of the UN Secretary-General’s Global Strategy of Women’s and Children’s Health. Richard received the Edinburgh medal in 2007 and the Dean’s Medal from Johns Hopkins School of Public Health in 2009. He is a Council member of the University of Birmingham. He has written two reports for the Royal College of Physicians of London: Doctors in Society (2005) and Innovating for Health (2009). He wrote Health Wars (2003) about contemporary issues in medicine and health. In 2011, he was elected a Foreign Associate of the US Institute of Medicine. Technology and medical education are often viewed as necessary bedfellows, but not without dispute. The debate often exists about just how to incorporate the “right” technologies at the “right” time and the “right place” when considering the medical education continuum. There are advocates of keeping things status quo, while others (often deemed cowboys and zealots) who believe that technology should replace many existing (standard) platforms. All, however, are interested in preserving Excellence in Medical Education. This plenary talk will take a lighthearted and humorous approach to understanding this technology tug of war, in which there will be an opportunity to see one view about where technologies can, should and will fit in. There will also be a focus on just how technology can help the current and future healthcare providers improve communication with each other and, dare I say, with their patients as well. There are detractors who believe that technology will irreparably damage the physician/patient relationship while others see technology as the link that has been missing in this relationship. Over the course of 30 minutes these topics will be discussed, and it is hoped that the audience will be active participants in the presentation, regardless of which view they have! Lawrence Sherman, FACEHP, CCMEP, Senior Vice President, Educational Strategy at Prova Education, has been involved in continuing medical education for the last 19 years. He has spent the majority of this time designing, developing, delivering and evaluating CME courses for physicians and other healthcare professionals around the world. He is a Fellow of the Alliance for Continuing Education in the Health Professions, a founding advisor to the NC-CME (the organization that certifies CME professionals in the US), an instructor at the Emergency Medical Institute at the Center for Learning and Innovation of the North Shore/Long Island Jewish Health System in New York, and has taught healthcare communications at the Center for Communicating Science at the State University of New York, Stony Brook. He currently hosts Lifelong Learning, a radio show broadcast on ReachMD via satellite radio in the US and via reachmd.com and a mobile app for smartphones worldwide. Lastly, Lawrence frequently lectures around the world on topics including: roles of social networking in CME; regulations and guidelines in CME; international/global CME and CPD; healthcare communications; outcomes measurements in CME; the use of emerging technologies in medical education; strategic medical education. Having once been a stand-up comedian in New York, his lectures and presentations tend to combine humor, compelling content, and audience involvement. 0830-1015 - Symposium 2A - Competencies and Milestones: Will those who ignore the past be condemned to repeat it? Summary: Competencies and milestones are on the minds of medical educators around the world. For example, the United States Accreditation Council for Graduate Medical Education developed “outcomes-based milestones for resident performance within the six domains of clinical competence. The milestones are competency-based developmental outcome expectations that can be demonstrated progressively by residents and fellows from the beginning of their education through graduation to the unsupervised practice of their specialty.” At first glance, these new requirements will demonstrate accountability of the effectiveness of graduate medical education, but the unintended consequences may outweigh potential benefits. Looking from an assessment standpoint from inside medical education, and outside medical education in the K-12 and Department of Defense educational systems, one can see that following the competency and milestone roads perhaps is not a desirable direction. Attending this session will inform participants of what has been tried previously, and hopefully, warn them against repeating the same mistakes. 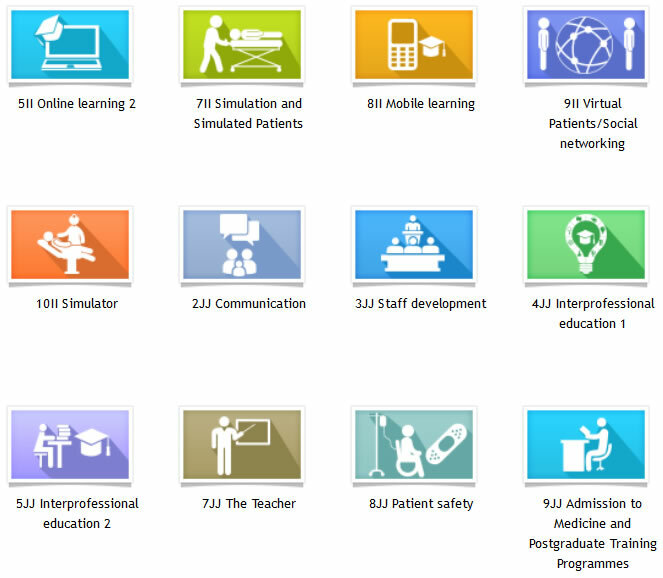 Summary: There is an increasing variety of technology available to the 21st medical educator, from social media (such as Twitter and You Tube) facilitating free open access education (FOAMed) to large knowledge repositories and simulations to Massive Open Online Courses (MOOCs). The challenge for all medical educators is to resist the temptation of adopting the latest technology without considering how the technology can be used to facilitate effective learning. This symposium will offer participants a range of established and newer educational theories, from multimedia design and deliberate practice to ecology of learning and connectivism, and illustrate how these theories can critically inform the use of technology to create effective personal and collaborative learning. Participants will have the opportunity to consider the extent to which they currently use theory to create learning opportunities with technology and to explore how they can produce innovative learning with technology by the use of newer theories. An opportunity to hear live and recorded interviews with speakers and other conference participants. Summary: In 2011, a Dutch “media star” professor in social psychology appeared to have drawn on fantasy instead of flesh and blood respondents for his studies. Some of these studies were published in high impact factor journals such as Science. This case brought into the spotlight the very thin line between correct and incorrect scientific behavior. This symposium reflects on this thin line to stimulate a nuanced discussion of scientific sloppiness as it relates to medical education research. We will consider varying scenarios. For example, if you try a statistical test other than the originally-planned test and this gives “better” results, which should you report? Where is the line between intuitive interpretive leaps and distortion in qualitative research? What degree of contribution truly justifies co-authorship? Does incomplete reporting inadvertently (or intentionally) hide important study details? We invite all researchers, both seasoned and aspiring, to join this conversation on how to prevent “sloppiness” in our research. Summary: There are changing ideas, definitions and debates about the concept of validity in the assessment world. While the traditional psychometric discourse has been, and is still, dominant in medical education assessment, there are growing concerns that there are limitations to this view. This symposium scrutinises medical education assessment in relation to more modern argument-based approaches to validity, by bringing together different researchers to provide an international perspective of how far the modern views of validity have impacted on medical education testing. Summary: The use of simulation-based mastery learning (SBML) for acquisition of clinical skills and professionalism is growing rapidly in medical education. Mastery learning is a stringent form of competency-based education where high achievement is expected of all learners with little or no outcome variation. Clinical skills include invasive and surgical procedures and communication with patients, families, and health professionals. Research demonstrates that SBML, used under the right conditions (e.g., curriculum integration, deliberate practice, rigorous measurement, feedback, faculty preparation, organizational support), can have large and sustained effects on knowledge and skill acquisition and maintenance among medical learners. Research also shows that SBML can achieve translational outcomes measured by improved patient care practices and patient and public health outcomes. This symposium will have four presentations: (a) SBML features, (b) outcome measurement, (c) translational results, (d) implementation issues, and will include ample time for audience participation and discussion. 1400-1530 - Symposium 4B - New Perspectives on Curriculum and Course Design: The End of PBL? Summary: How can curriculum and course design be optimised to achieve the best possible results? PBL seemed to be the answer, but new perspectives stress the importance of gradual development of professional competencies. Four-component instructional design (4C/ ID), for example, supports a gradual development by sequencing learning tasks from simple to complex, and tasks are combined with guidance/ support that gradually decreases in the learning process. 4C/ID is based on solid psychological principles and emphasises the characteristics of learning tasks: They are based on real-life tasks and preferably involve knowledge, skills and attitudes. This new perspective differs not only from traditional discipline-based curricula, but also from PBL curricula where knowledge is typically taught in PBL groups, skills in a skills lab, and attitudes in simulated patient contacts. This symposium will explore differences and commonalities between competency-based and PBL curricula. Contributors will debate the question: Is this the end of PBL? Summary: Accreditation is a summative process where schools are judged on their compliance with defined standards at a particular point in time. However, compliance with standards is often not achievable by a school working hard just before an accreditation review. This means that there is a need to include an on-going system of continuous quality improvement (CQI) related to accreditation expectations and educational quality as part of the process. This raises some controversial questions and challenges, for example: How, if at all, should the CQI and accreditation processes be linked? Should accreditors make CQI mandatory? Should CQI be formative? Should the results be known by accreditors? These and related questions will be debated by the panellists and discussed by the audience. By the end of the session, participants should understand the range of options for a CQI process focused on achieving and maintaining compliance with accreditation standards. Summary: Geoff Norman will review dual processing theories of clinical reasoning. Henk Schmidt will share recent studies on potential sources of diagnostic errors and strategies to minimize them. Sílvia Mamede will present research on the use of structured reflection as an instructional approach in clinical teaching. Within the same line of investigation, Martine Chamberlain will bring new insights about the effects on learning of self-explanation while solving clinical problems. Steven Durning will present research on instructional authenticity and its relation to learning clinical reasoning. Through this series of presentations, the symposium will provide participants with an overview of recent research on different aspects of clinical reasoning development. Subsequent discussion with the audience will explore what we can learn from this research to improve clinical teaching. Summary: Physical space has been neglected in its impact on the success of learning. Health programs are accommodated in traditional didactic learning spaces: lecture theatres, seminar rooms, and separate buildings for academic disciplines. Hospitals have limited provision for student learning. Yet learning patterns and educational methods have been transformed. What are the trends globally in providing high performance learning spaces that respond better to emerging needs? What are the key design features? What can we learn from the innovative work and learning spaces in the corporate and other sectors? This plenary will address the overall issue of aligning the curriculum with physical learning spaces. Jonas Nordquist, PhD, is the director of the Medical Case Centre at Karolinska Institutet and he is the associate DIO, in charge of the strategic educational development for the residency programs at the Karolinska University Hospital. He received his PhD in political science from Stockholm University in Sweden in 2001 and joined Karolinska Institutet in 2003. Dr. Nordquist is a Harvard-Macy scholar in medical education at Harvard Medical School. He has been involved in projects in more than 40 countries around the world and is the author of three books and several peer-reviewed papers. He is an affiliated scholar at the Wilson Centre, University of Toronto. He is also visiting faculty at the International Medical University in Kuala Lumpur, Malaysia; Makerere School of Medicine, Kampala, Uganda; medical educational expert to the University of Addis Ababa, Ethiopia; visiting professor and external assessor to the Guatemala Medical Academy. He has served as a WHO expert in medical education. Dr. Nordquist’s research focuses on educational leadership and also currently on how physical space impacts on learning. Andrew Laing, PhD, is the global practice leader for the Strategy + consulting practice at AECOM, (formerly DEGW). The practice specializes in research and advice to clients on the design performance of work and learning environments. He joined DEGW in 1989 and took a lead role in developing the firm’s consulting services worldwide, founding the North American practice in 1998 after working in London since 1989. He received his PhD in urban studies and planning from MIT in 1988, and studied architecture and planning at University College London. Dr. Laing is also a visiting lecturer at Princeton University, School of Architecture, a Senior Fellow at the Center for Urban Real Estate at Columbia University, Graduate School of Architecture, Planning and Preservation, and a Senior Fellow at the Global Cities Institute, University of Toronto. His interests span the changing worlds of work, learning, information technology and the design of places at multiple scales from the workplace to the city. His clients have included Accenture, Ford, Google, GlaxoSmithKline, Microsoft, Nike, Novartis, and the United Nations, among others. He co-authored the books: The Responsible Workplace (1994) and New Environments for Working (1998) and published many articles. For more information on the ASPIRE Awards visit the ASPIRE-to-Excellence website. Summary: This symposium is aimed at those wishing to conceive, build, and study Longitudinal Integrated Clerkships (LIC) in order to advance clinical education. Internationally, LICs are gaining in popularity as an alternative to traditional block rotations. The presenters bring a wealth of diverse experiences of LICs from Harvard, Maastricht, and Outback Australia, and will share innovative theoretical insights. It has been suggested that the impact of LICs could be as radical for medical education as the introduction of problem-based learning. Research suggests that “educational continuity” benefits students and the communities in which they serve, particularly in under-resourced settings. LICs are effective for advancing student learning of science and clinical practice, enhancing professional identity, and supporting workforce goals such as retaining students for primary care and rural and remote practice. So far relatively few established LICs currently exist, and there are differing models. The symposium will provide ideas for all medical schools wishing to incorporate some of the general principles of LICs in their clinical education programmes. Summary: Professionalism has become a competency international medical educators strive to cultivate. Students’ professional formation is influenced by their experiences of professionalism dilemmas, and new developments in research show that cultural context can impact their reactions to professional challenges. In this symposium, Lynn Monrouxe and Charlotte Rees will present their study of students’ personal incident narratives (PINs) of professionalism dilemmas in England, Wales, and Australia. Madawa Chandratilake will present a study employing the same method in Sri Lanka. Ming-Jung Ho will present the PINs of Taiwanese students followed by comparative studies of Taiwanese students’ reactions to standardized video clips of professionalism dilemmas versus the reactions of international students in Taiwan. Fabrizio Consorti and Shiphra Ginsburg will present studies from Italy and Canada using the same video clips. We expect active participation from the audience in the discussion session following the stimulating presentations. Summary: Medical educators around the globe experience competing demands on their professional time that include research, patient care and administrative responsibilities just to name a few. In this time when most professional rewards and recognition are prioritized toward research and patient care, it is critical that medical educators consider how they can most effectively promote their teaching and research in medical education locally, nationally and internationally. In this symposium, participants will learn about three initiatives aimed at promoting careers and scholarship in medical education: (1) The Impact of Teaching Academies on the Educational Mission at Academic Health Centers in the US (Katherine Hyland); (2) Catalyzing the Scholarship of Teaching through Medical Education Research Partnerships (Manuel João Costa); (3) Creating an Institutional Mandate for CENTILE (Center for Innovation and Leadership in Education) (Aviad Haramati). The presentations will be followed by a question and answer period and general discussion. Summary: In both qualitative and quantitative studies there is a reasonable chance for researchers’ assumptions to influence research outcomes. Choices or assumptions regarding underlying theories, selected methodologies, causal relations, non-responders, sampling strategies and researchers’ perceptions induce uncertainty about research findings. Researchers tend to treat these factors as potential study limitations, but how they may impact research findings is rarely explicated and therefore mostly unknown. We will introduce innovative hands-on approaches to address and interpret potential influencing factors in medical education research. We will demonstrate how two different qualitative approaches of the same data influence the insights that emerge. We will explain how researchers can quantify the potential impact of specific assumptions on their research outcomes using sensitivity or bias analyses. Across specific paradigms, we aim to inspire researchers to address uncertainty in research findings more explicitly, for example by using alternative models to answer the same research question. Summary This symposium is intended to reposition the purpose and value of research in the second decade of the 21st century. There are several fundamental questions that will be addressed. What is meant by research? Why is Research Important? Who should do it? When is the optimum time to undertake it? There are other challenges and areas where we seek more elucidation. Is the undergraduate and postgraduate curriculum informed by research, and what opportunities are there to engage with research and research undertaking staff? How satisfied are we that the structures are right to allow research in a timely fashion? Is a research degree increasingly a badge of honour and a marker of ability, perseverance and ambition? Are we getting the outcomes we seek? Should research be obligatory as it is in some postgraduate programmes? Equally we must remember that many institutions do not get rewarded for teaching but rely on their research income to run programmes and departments. All these statements need to be examined and debated in earnest. Summary: This symposium focuses on the theoretical and translational foundations of continuing professional development (CPD). A panel discussion format will highlight three themes that are critical to effective continuing education (CE) and continuing professional development: 1) competence and assessment of learning and change, 2) Complex learning and application, and 3) the importance of Micro and Macro Systems learning. The theoretical foundations for learning and change, knowledge translation and integration into practice are essential to building a framework for educational growth and ongoing competence. Effective CE/CPD closely aligns quality improvement data with the demands and expectations of the workplace environment, linking profession-specific behaviors with interprofessional competencies necessary in the workplace environment. As CPD builds on theoretical and evidence-based approaches, CPD professionals need to assess the impact of micro and macro systems on the desired individual and team performance behaviors and competencies necessary for improved care outcomes. Summary: Although there is a growing consensus that professionalism is fundamental to the practice of medicine and that it must be taught, learned, and evaluated throughout the continuum of medical education, medical educators have paid much less attention to professional identity and its formation. We also know that a central function of a medical school is to provide the learner with “a professional identity so that he can come to think, act, and feel like a physician” (Merton, 1957). The goals of this symposium are to: link the notion of professionalism to professional identity formation; discuss the role of socialization in medical identity formation; and provide an example of how one educational program supports students in their journey from layperson to professional. Principles of fostering professional identity formation will also be explored as will educational strategies that can help us move from teaching professionalism to supporting professional identity formation. Summary: The goal is to open the discussion on the culture of education in medical schools. It is important to debate the actual situation and create a holistic overview by promoting an interactive discussion with the main speakers that includes the students’ perspective. Topics to be addressed include: innovative teaching methods that are being practiced at present; medical students’ and young doctors’ health; the environment of learning, and the presence or absence of the culture of bullying and reporting in medical schools; interprofessional education and collaboration; students’ integration in the first year of medical school; students’ adaptation for the job market; other sources and educational tools that students are using to enrich their education. With this debate, participants will have a global overview of what the culture of education of medical schools is nowadays, what it should be and what are the expectations and challenges for the future. The National Board of Medical Examiners (NBME) established the John P Hubbard Award in 1983 in special tribute to the late John P Hubbard, MD who served as the chief executive of NBME for 25 years. This award recognizes individuals throughout the world who have made a significant and sustained contribution to the assessment of professional competency and educational program development at any level along the continuum of medical education and delivery of healthcare. This session will feature the work of three recipients of the Hubbard Award and consider the impact of their work on assessment worldwide. 1045-1110 - 11A - Ronald Harden, General Secretary/Treasurer, AMEE, UK (Hubbard Award Winner: 1992). Ronald Harden MD is Professor of Medical Education (Emeritus) University of Dundee, Professor of Medical Education, Al-Imam University, Editor of Medical Teacher and General Secretary/Treasurer of AMEE. Ideas which he has pioneered include the OSCE, the spiral curriculum and the SPICES model for curriculum planning and models for outcome-based education. He has published more than 400 papers and two best-selling books. His contributions to medical education have attracted numerous awards including an honorary fellowship of the Royal College of Physicians, Surgeons of Canada, the Hubbard Award by the National Board of Medical Examiners in the USA, and The Karolinska Institutet Prize for Research in Medical Education. He was awarded the OBE by the Queen for his services to medical education. 1110-1135 - 11B - David Newble, Professor of Medical Education, School of Medicine, Flinders University, South Australia (Hubbard Award Winner: 1997). David Newble MD, FRACP, FRCPE graduated in Medicine from Edinburgh University (1965). Me migrated to Australia and undertook clinical training as a Physician (Internist) and research training as an immunologist (MD, 1975). He spent the majority of his career as a medical academic at the University of Adelaide developing a special interest in Medical Education – curriculum development, assessment of clinical competence and student learning. In 1999 he was appointed foundation Professor of Medical Education at the University of Sheffield (UK) and now holds an honorary position as Professor of Medical Education at Flinders University in South Australia. More recently he worked as a curriculum development consultant to medical, dental and veterinary schools in Australia and New Zealand. Has published over a 100 papers and co-authored several well-known books including ‘The Handbook for Medical Teachers’ and the ‘International Handbook of Research in Medical Education’. His work led to the John Hubbard Award in 1997. 1135-1200 - 11C - Richard Reznick, Professor, Department of Surgery, Dean, Faculty of Health Sciences, Queen’s University, Canada (Hubbard Award Winner: 2000). Richard Reznick MD received his undergraduate education and medical degree from McGill University, a Masters in medical education from Southern Illinois University and a fellowship in colorectal surgery at the University of Texas, Houston. At the University of Toronto he was inaugural Director of the Wilson Centre, Vice President of Education at UHN and R. S. McLaughlin Professor and Chairman of the Department of Surgery. In July 2010, Dr. Reznick assumed the position of Dean, Faculty of Health Sciences at Queen’s University and Chief Executive Officer of the Southeastern Ontario Academic Medical Organization (SEAMO). 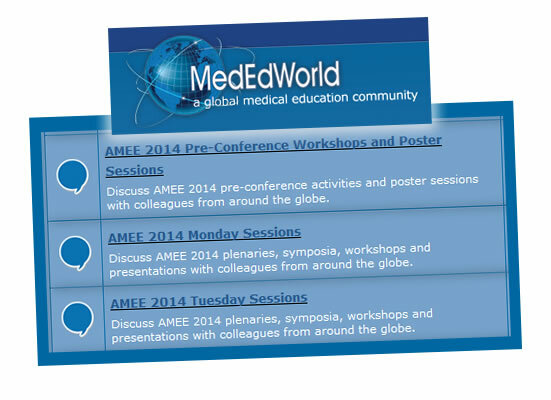 AMEE 2015 will take place in the SECC, Glasgow, UK from 5-9 September 2015. You can access the full programme and abstracts, and build your own schedule of sessions and presentations you would like to attend. You can also connect with AMEE Online: Facebook, Twitter, LinkedIn and YouTube Channels and upload your own photographs into the conference gallery. The App can be accessed on laptops, tablets and smartphones.